These 12-inch mortars were manufactured at the Watervliet Arsenal, Watervliet, New York in 1901. The carriages are the Model 1896 and were manufactured by the American Hoist and Derrick Company, St. Paul, Minnesota. The fortification you are standing in is known as Battery Laidley, in honor of Colonel Theodore T.S. Laidley, who had served in the Mexican and Civil Wars and died in Florida. In August, 1902, eight mortars were mounted. 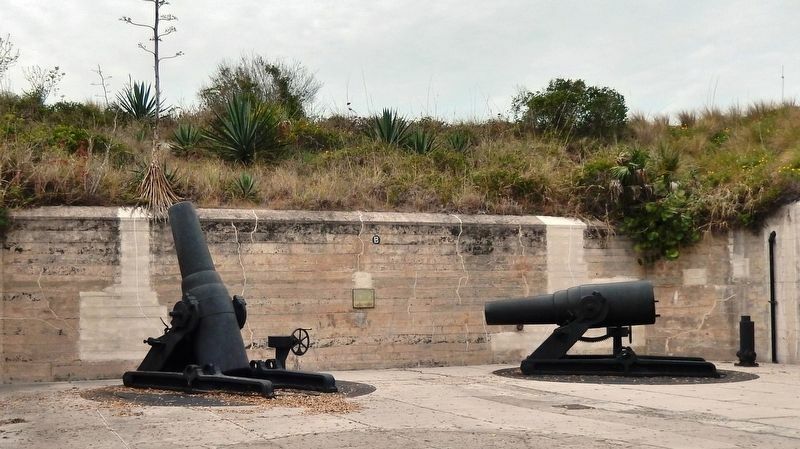 However, the weapons were not test-fired until November 19 & 20, 1903, (five years after the fort's foundations were laid). The mortars stood ready to defend the harbor of Tampa Bay but never fired a shot at an enemy. The only time they were fired was during practice. 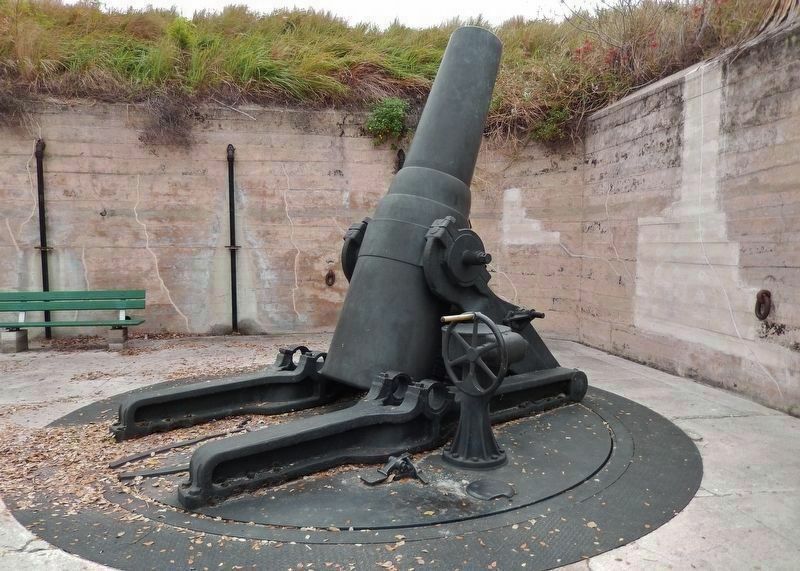 In 1917, four of the eight mortars were dismounted and shipped to Fort Rosecrans, San Diego, California for coastal defense. After World War I, many weapons such as these were melted down to be converted to other types of weaponry. 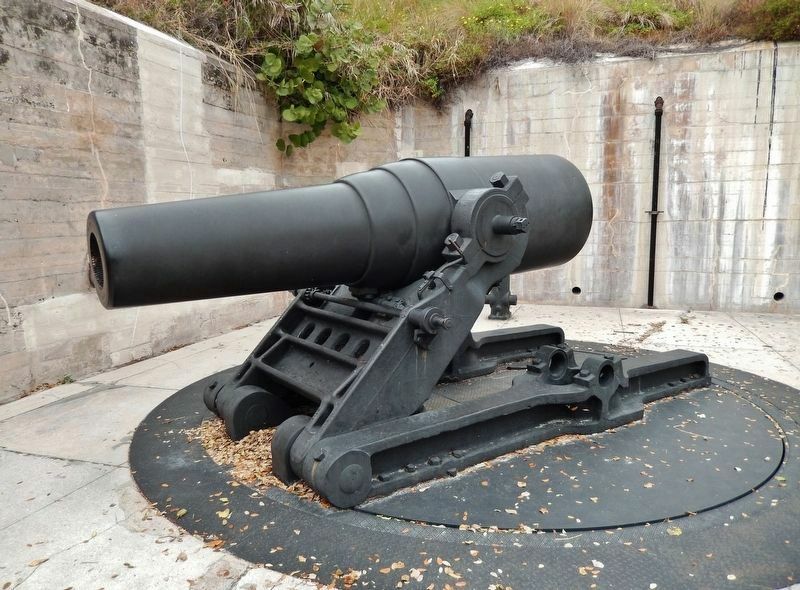 Today Fort De Soto has the only 12-inch seacoast mortars, Model 1890-M1, in the continental United States. The only other ones in the world are on the island of Corregidor in the Philippines. Artillery spotters, in towers, directed the firing of the weapons. They relayed readings, by telephone, to the relocating room; then the information was transmitted to the data booths just behind the gun pits. 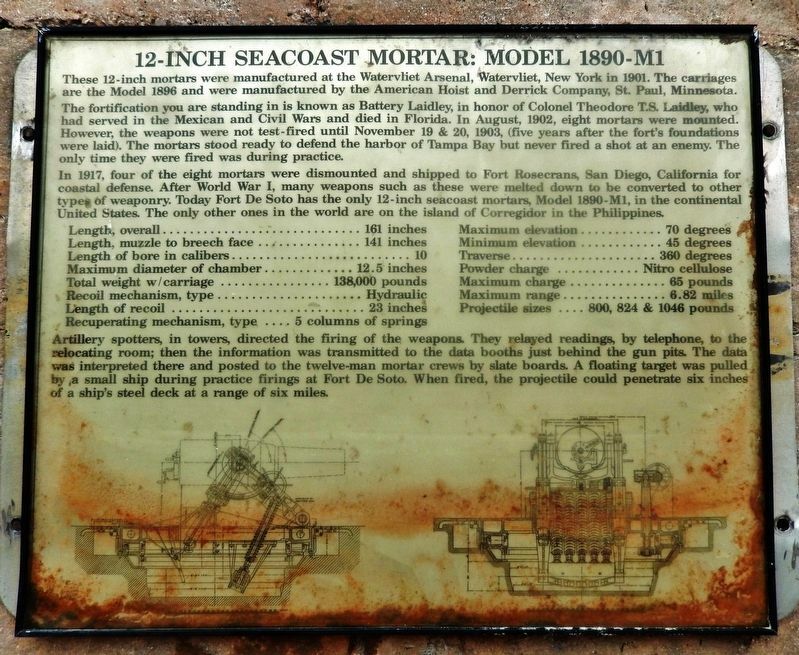 The data was interpreted there and posted to the twelve-man mortar crews by slate boards. A floating target was pulled by a small ship during practice firings at Fort De Soto. When fired, the projectile could penetrate six inches of a ship's steel deck at a range of six miles. Location. 27° 36.916′ N, 82° 44.157′ W. Marker is in Tierra Verde, Florida, in Pinellas County. Marker can be reached from Anderson Boulevard (State Highway 679) 1½ miles west of Pinellas Bayway South, on the left when traveling west. Touch for map. 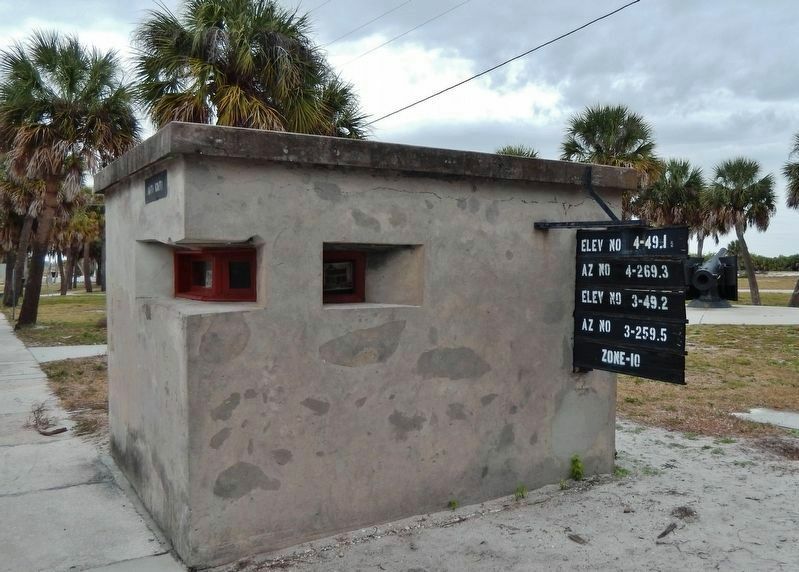 Marker is located within Battery Laidley at Fort De Soto Park, just north of the Gulf Fishing Pier parking lot. Marker is at or near this postal address: 3500 Pinellas Bayway South, Saint Petersburg FL 33715, United States of America. Touch for directions. Other nearby markers. At least 8 other markers are within 6 miles of this marker, measured as the crow flies. Fort De Soto Batteries and Military Post (within shouting distance of this marker); Spanish-American War Cannons from Egmont Key (within shouting distance of this marker); Spanish American War Memorial (within shouting distance of this marker); Fort De Soto Quartermaster Storehouse Museum (about 600 feet away, measured in a direct line); Tierra Verde Mound (approx. 3.8 miles away); Zephaniah Phillips' Homestead Site (approx. 5 miles away); "Pass-A-Grille" (approx. 5.1 miles away); Passage Key (approx. 5.6 miles away). Touch for a list and map of all markers in Tierra Verde. 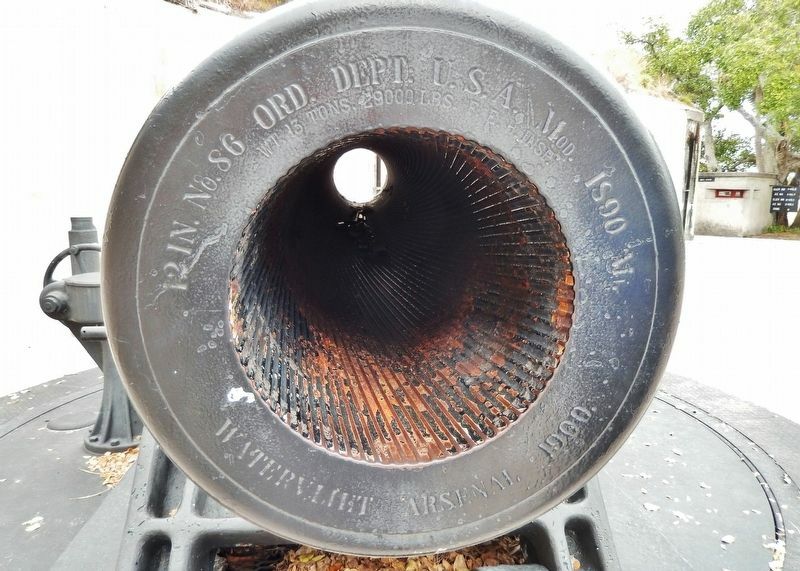 12-inch steel mortar, M.1890MI. Mounted on spring return carriage, M.1896, similar to the ones at Fort De Soto. Photography is from the book, The Service of Coast Artillery, by Hines and Ward, 1910. ...To our knowledge these are the only 12” Seacoast mortars mounted on carriages in the continental U.S. The only other mortars we know of are in Corregidor, in the Philippines. More. 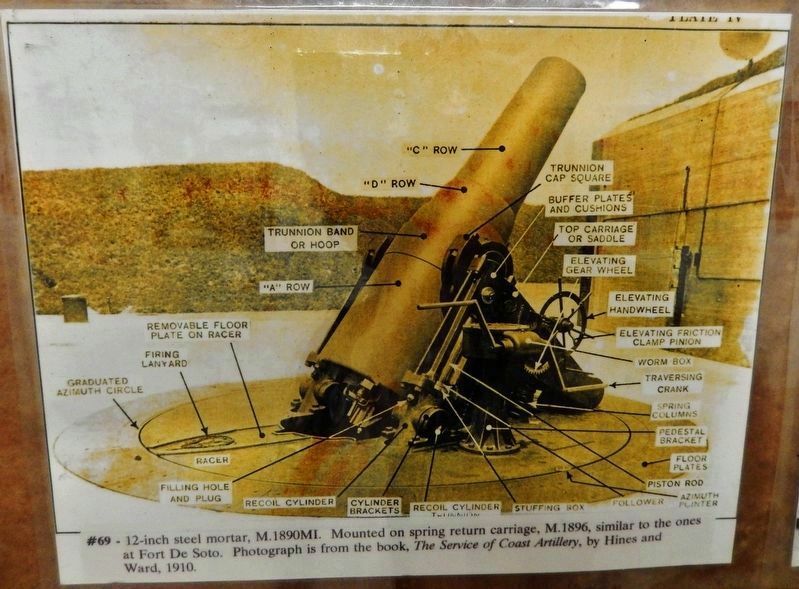 Search the internet for 12-inch Seacoast Mortar: Model 1890-M1. Credits. This page was last revised on April 9, 2019. This page originally submitted on April 8, 2019, by Cosmos Mariner of Cape Canaveral, Florida. This page has been viewed 43 times since then. Photos: 1, 2, 3. submitted on April 8, 2019, by Cosmos Mariner of Cape Canaveral, Florida. 4. submitted on April 9, 2019, by Cosmos Mariner of Cape Canaveral, Florida. 5. submitted on April 8, 2019, by Cosmos Mariner of Cape Canaveral, Florida. 6. submitted on April 9, 2019, by Cosmos Mariner of Cape Canaveral, Florida. 7, 8. submitted on April 8, 2019, by Cosmos Mariner of Cape Canaveral, Florida.